The much-ballyhooed ban on smoking on Pattaya’s beaches has failed due, as so often is the case, to lack of enforcement. The ban on beach smoking went into effect Feb. 1 after months of public relations efforts. Rallies, yoga classes and parades were held before officials said they’d start enforcing the law that went into effect last year. Then Feb. 1 came and, after a few days of media events, the enforcement officers went back to not enforcing the law. 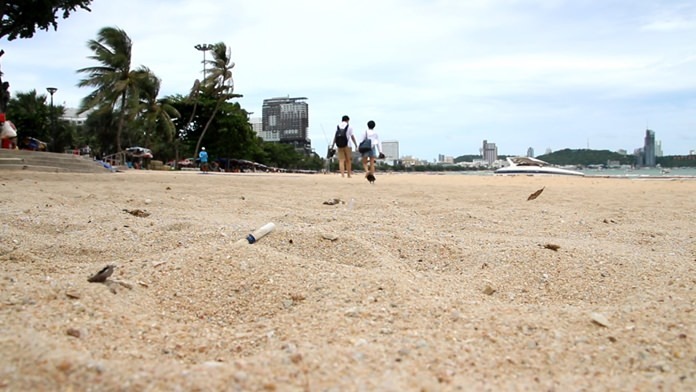 Pattaya Beach on Aug. 2 was covered in cigarette butts with not a city hall officer in sight, nor any effort to clean them up. There are plenty of signs and some half-full ashtrays in the designated smoking zones, but no other effort to make the beach smoke-free. Deputy City Manager Wuthipol Charoenpol said commissioned police officers are the only ones who can enforce the fines of up to 100,000 baht, but city hall has not pushed the Pattaya Police Station to enforce the ban because it might hurt tourism – although filthy beaches don’t help. He said he would look into dispatching more officers to patrol the beach.